Theater in the Now: Review: Honey, I'm Radioactive! 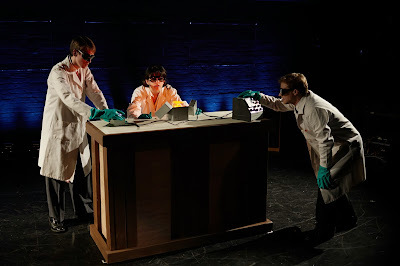 Four physicists work on a bomb. No this isn’t the start of a corny joke. It’s the premise of a smart and clever production inspired by historical events. In the age of cheery housewives and new innovations that will change the world, Chloe Brown’s Obedient Steel examines what happens when smart people have an accident and forced into a life unknown. Obedient Steel follows a group of physicists who are on the verge of a great atomic triumph when a misread changes their lives forever. Obedient Steel started as an idea by a group of artists. As a result, Brown, director Rebecca Wear, and the rest of the Tugboat Collective team created, what their characters were hoping to produce, a sensation. The script is really broken down into two acts. The first follows team leader Bill, newfound lovers Dennis and Marnie, and spitefully hilarious Jack as they use big words and scientific lingo to create the next big thing. When they test their work and the meter was read wrong, they’re forced to leave the bunker and live a civilian life, thus leads us to act 2. While the first part is full of energy and fun, the second contrasts, sometimes falling into melodrama. The first part of the play is much more interesting and engaging than the second. While the situation has changed completely for the characters as we watch the effects on their physical being, finding the balance of humor and fun could help the energy not lag. This energy lag may also be due to the lack of Jack. The ensemble of six is stellar, lead by a brilliant performance by Max Reinhardsen as Jack and Anastasia Olowin as Helen. Olowin embodies the bright, sunny disposition of the stereotypical 50s housewife. Reinhardsen is fantastic as the hilarious catalyst of chaos. He has brilliant timing as a comedian and is dynamic in his deeper moments. Even when he’s not the main focus on stage, your eye veers to him to see his reactions. While he’s forced to profile-standing monologues in the second part of the play, he still shines. Kate Thulin and Nathaniel Bash-Gould have a nice chemistry as the intelligent couple. Director Rebecca Wear does a masterful job discovering the moments of light and humor and balancing it out with the dark reality of civilian life. She incorporates and welcomes the audience as they enter the theater, viewing a little party filled with dancing and lights, something that helps us know despite the science we may not understand, the characters are just like you. Wear has a skill at maintaining the story and characters and keeping them as the focal point. The only storytelling point that could be elevated much more is mad Jack at the blackboard. It’s his actions that sets the world on fire, but unless you’re watching him while Dennis and Marnie are talking, chances are you missed this key bit of plot. Eben Hoffer’s sound design, both recorded and live foley adds brilliant personality to the world of the play. The lighting by Isabella F. Byrd is quite spectacular. One of the finer moments is when Jack, Marnie, and Dennis are writing on the blackboards created by string and a blue lights illuminates the string casting a dynamic glow against the wall. The moral of this story should be when you have an idea, you should act upon it. Even if it turns out to be a disaster like it does for the characters in Obedient Steel, it was acted upon. Fortunately for Tugboat Collective, their idea turned out to be a success.